In his traditional Christmas day Urbi et Orbi address, Pope Francis said his wish for a happy Christmas was for fraternity among individuals, regardless of nation, culture, ideology, or religion. The Pope prayed specifically for Syrians, expressing the wish that they could “find fraternity after long years of war” and that through international cooperation those who have fled the Middle Eastern country might be able to return home. Another country he prayed specifically for was Yemen, expressing the hope that the recent truce brokered by the international community would hold and bring relief to Yemen’s people and children “exhausted by war and famine”. Since 2015, roughly 10,000 people have been killed in the conflict in Yemen, which has seen 14 million Yemenis pushed towards the brink of famine. Elsewhere in his Christmas message, Pope Francis offered special prayers for peace in the Holy Land, Africa, Ukraine and Nicaragua. 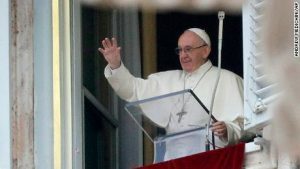 The Pope called for a resumption of dialogue between Israelis and Palestinians so that a path to peace would be found to end the 70-year conflict in “the land chosen by the Lord to show his face of love”. Separately, the Vatican Secretary of State, Cardinal Pietro Parolin, is currently visiting Iraq and his visit has been described as “very welcome” by the auxiliary bishop of Baghdad, Bishop Shlemon Warduni. While in Iraq, Cardinal Parolin was due to meet members of the Iraqi government and representatives of the Oriental Churches. The Vatican’s second in command concelebrated the Christmas Vigil Mass with the Patriarch of Babylon of the Chaldeans, Cardinal Louis Raphaël I Sako, at the Chaldean Cathedral of Saint Joseph in the Karrada district. Cardinal Parolin visited the Syrian Catholic Church of Our Lady of Salvation, where in 2010 a terrorist killed dozens of faithful and two priests. The Cardinal also visited other places symbolic of Baghdad as well as charities. Today, St Stephen’s Day, Cardinal Parolin travels to Erbil in northern Iraq, where he will meet representatives of the government of the autonomous province of Iraqi Kurdistan. From there he will depart for a visit to the Nineveh Plain and celebrate Holy Mass in the town of Qaraqosh. Prior to Cardinal Parolin’s arrival, Bishop Shlemon Warduni pointed out that the visit represents a sign of encouragement for all Christians in Iraq, whose presence is diminishing because of persecution and the difficulties many experience trying to eke out a living. “Almost a million Christians have left Iraq – a nation that has seen the presence of Christians for over two thousand years,” he explained. The bishop denounced those seeking to “empty the Middle East of Christians”. Last week, Archbishop Eamon Martin of Armagh spoke about his visit the previous week to Iraq where he met people who had been displaced from their homes by Isis. He said they were unable to “openly celebrate Christmas in the way that we do here; you won’t have Christmas trees or Christmas lights on the streets,” as Iraq is now an overwhelmingly majority country of Islam. Dr Martin explained that his visit to Iraq was his third attempt to go there but that the previous two visits had to be cancelled because of the instability in the region. “Three years ago, Archbishop Warda asked us to see if we could do anything to help because literally the displaced Christians from the Nineveh Plains had arrived on his doorstep and he was floundering. At the same time he was very intent on helping, so he established camps and clinics and schools for them and we, through Trócaire, were able to provide some support to him. According to Archbishop Martin, Archbishop Warda is looking for something more than simply the rebuilding of the bricks and mortar – he is trying to rebuild confidence and rebuild hope in a people who are among the earliest Christians in the world – the people of the Nineveh Plains. For Archbishop Eamon Martin, “one of the saddest moments in Iraq” was his visit to a desecrated graveyard. “My mother died earlier this year and visiting a graveyard has suddenly taken on a new significance for me. To walk into the graveyard in Batanaya and see the way hatred desecrated that sacred space. When you strike at a family grave, I think you strike at the heart of a family.